You have undoubtedly heard some discussion about data coming out over the last couple of years suggesting the risk of running vasopressors via peripheral IV's is less than we previously thought. Well I'm here to tell you: don't let your central line skills erode just yet. While new studies that change our practice are exciting, we must be careful not to be early adopters after reading just the headlines. We are prone to get excited after seeing new data in medicine but we risk losing ground. An example of this that comes to mind is Targeted Temperature Management (TTM). The TTM trial came out in 2013. The headlines that immediately followed were telling of our plight: "We don't have to cool patients anymore!" If you didn't stop to read the paper, or read any of the trial discourse in the critical care community, you would have been misinformed. The trial opened a much larger debate that providers are still discussing today. Is 33 or 36 degrees better? Is it prevention of hyperthermia that matters more than the hypothermia itself? No matter the final answer, the correct choice is certainly not to stand idly by after every cardiac arrest. Peripheral vasopressors fall into the same category. Are they safer than we thought? Looks like yes. Are we using them correctly? Absolutely not. An interesting study was published in the Journal of Hospital Medicine in 2015; at first glance, the data sounds great. They were able to successfully infuse norepinephrine, phenylephrine, and dopamine via peripheral IVs in 734 patients with only a 2% extravasation rate. Those that had extravasation were successfully treated with phentolamine and nitroglycerin paste and had no local ischemic injury. However, when you read the paper you start to realize that the study followed a strict regimen. They were not just running peripheral pressors and leaving the patients alone. All peripheral IVs were placed under ultrasound guidance and there were strict guidelines on which vessel could be cannulated and how IVs were monitored during the infusion. 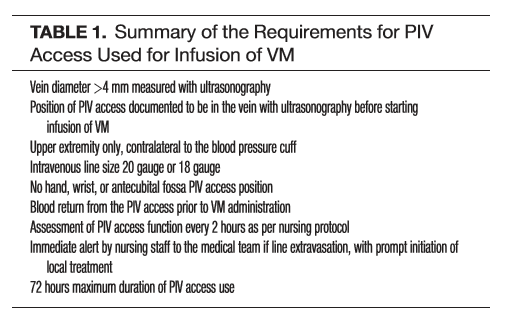 See the table below for the full list of strict peripheral IV requirements. I've noticed a more relaxed approach to peripheral pressors over the last year after some of these recent articles were published. Fighting against our tendency to only read the headlines, I decided to look at the research and read the ongoing discourse. When I first started several years ago, we didn't let our shift end with someone on peripheral pressors without popping in a CVL before leaving. In fact, I frequently saw people rush to throw in lines before needing pressors for fear of running them peripherally. In hindsight, we probably don't have to fear peripheral pressors to that degree; but we should be smart about how we utilize them. We cannot let the use of peripheral pressors allow us to be nonchalant about shock patients. These patients still require our full attention – including full workup to determine WHY they are in shock. If you are going to run peripheral pressors you absolutely must know where the PIV is. Evaluate the site yourself, and discuss the maintenance plan with nursing staff. You need to ask yourself, "Am I leaving this patient on peripheral pressors because I truly think they will come off in the next few hours and placing a central line will do them a disservice? Or am I not placing a central line because it benefits me?" I am not opposed to changing my practice based on new data. I actually welcome it. I AM opposed to changing my practice without thoroughly reading on the subject and thinking through ramifications. If we were to properly implement peripheral pressors in our hospital system, it would be a massive undertaking. We would need consensus and protocols from pharmacy, nursing, and multiple provider groups. We’d have to operationalize extremity checks every 2 hours and provide training on ultrasound IV placement. Even after the protocols were created; a massive wave of education with staff would have to occur to avoid an extravasation case going unnoticed and resulting in local ischemic injury or major complication. Maybe this is a mission we should undertake to help reduce CLABSI's and other central line related complications. None of us get to make that decision in a vacuum. In the meantime, individual providers should be careful trusting peripheral pressors without a robust protocol of extremity monitoring. We should definitely know all the details of the studies so we practice appropriately. A systematic review of extravasation and local injuries with PIV pressor administration was released in the Journal of Critical Care in 2015. Interesting data points to note include 85% of adverse events were at PIV sites distal to the antecubital fossa. 96.8% of adverse events were with pressors running > 4 hours. Peripheral pressors are likely more safe than we thought. We should feel safe routinely starting peripheral pressors while gearing up for central line placement in our shock patients – especially if waiting for central line would delay patient care. That is the big message of these trials. This is why our ED colleagues are so excited about these studies. However, these conclusions not ready for primetime on a larger scale in the ICUs beyond 4 hours unless we are willing to put in the time to create protocols with strict PIV and extremity monitoring. I haven't researched the data on midlines vs PIV's for peripheral pressors and have heard anecdotal stories on both sides. My understanding had always been midline is actually less safe than PIV since extravasation can be masked with such a deep IV. However, based on the peripheral research I could see how an 18G midline is safer than a 22G PIV in the hand. I hope this post is a little controversial and starts some discussion! What’s your experience? What pressor is being infused and at what rate? ALOT has been written about this topic in #FOAMed. See some of the links below for good discussion.